FLINT, MI – It’s a battle of programs. 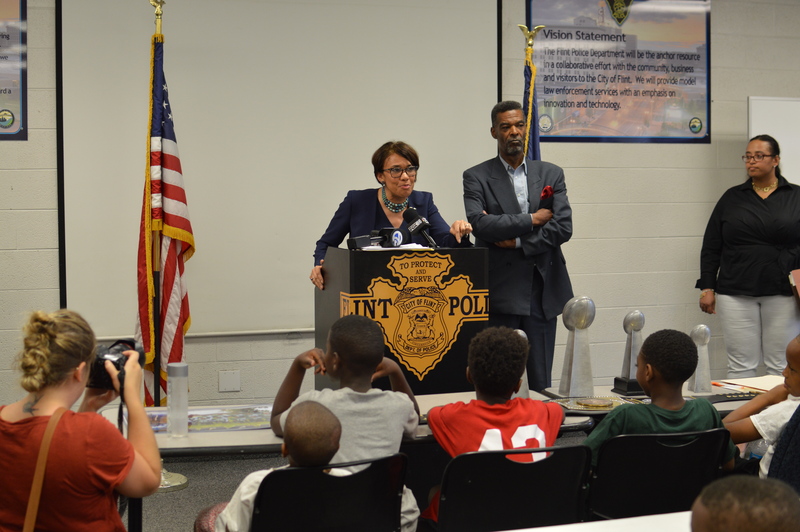 Two programs both created to serve Flint youth – One being supported by Flint City Council and another that has favor from Flint Mayor Karen Weaver’s administration. But so far, no one knows what the future will bring for either financially. Both parties held press conferences on June 16, 2017 to address their concerns to the media regarding Police Activity League programs in Flint. The Flint City Council allocated $70,000 in Flint’s budget for the PAL program at Haskell Community Center on Flint’s north side in the Civic Park area. Weaver vetoed the council’s move saying the program is not a city-run program and should not receive Flint funds. The council voted to override her veto in a special June 15, 2017 City Council meeting. Even though the council has allocated funds for Haskell’s program, Weaver still has the option of not giving the money to Haskell. Weaver was not at Poplar’s press conference, she did not say whether or not she will release funds to Haskell, during a press conference she held at 3:30 p.m. with Johnson and Flint City Councilman Eric Mays who is the only council member standing in support of the administration. Johnson has been at odds with Haskell’s board for months. In February, their dispute was made public after Haskell’s Board President Trachelle Young issued a press release saying Johnson was trying to evict the center organizers and cut funding. Johnson said in March that after a Flint Police officer was denied entry into the building he had his department sever ties with the program at Haskell ultimately launching another PAL program on the other side of town. He also added that he disagreed with some of the funding Haskell received being used to pay salaries. Young said that a $60,000 budget for salaries was set under former Police Chief James Tolbert for about seven employees. The highest salary was $500 per week. Haskell’s program is funded with Community Development Block Grant Funds through the Flint Police Department and serves an estimated 55 children per day during the school year. Young said those numbers increase to about 100 to 200 in the summer months. Haskell’s program provides organized sports activities, mentoring, tutoring and food giveaways for needy families. The program has been run out of the building at 2201 Forest Hill Avenue since 2009 and the council’s decision would bring in funding from the Flint Police Department’s budget and not Community Development Block Grant Funds. Johnson said his program serves about 200 children. Under his program officers volunteer to shuttle children to the south end of Flint for the program. Like Haskell, Johnson’s program also offers a number of activities including organized sports and after school programs. Youth programs have been offered through the Haskell Center for many years. Haskell has been the home to the PAL program for approximately eight years now and it should remain in the Northside of Flint where it was originally offered. It seems to only have become a problem since Weaver, Johnson and Mays became involved. Realistically, it’s extremely difficult if not impossible to throughly run an extensive daily youth program without some paid employees. Offering minimal salaries to a few employees ensures that adult supervision and support will be in place for the participants. Haskell has been a viable part of the community since the eighties if not before. During those years the Flint Community Schools took elementary students there for swimming lessons during the spring and summer. It would be a shame for the Mayor of Flint to remove funding for this well established and historical strong hold within the community. Are you really thinking of the children or are they becoming political pawns in your (Johnson and Mays) desire to have your way. So unfortunate for the Northend children who have suffered threw the loss of nearly all their community schools which served as summer fun strong holds. Haskell is one of the last places they have to turn to. Don’t take that away from them as well.